Reflections about wildlife and nature photography. Not all wildlife photos have an interesting story behind them, but when nature stories unfold before you it is an amazing experience. I remember watching Wild Kingdom as a child and more recently National Geographic or BBC documentaries. However, nothing can compare to multi-sensory experiencing of being there. This photo represents the story of a male leopard cub. The mother had hunted earlier that day and the partially eaten carcass was in a tree - yes you could smell it. Below that tree the female cub was eating one of the legs. The male cub had been exploring but it was getting dark and he returned to the tree. 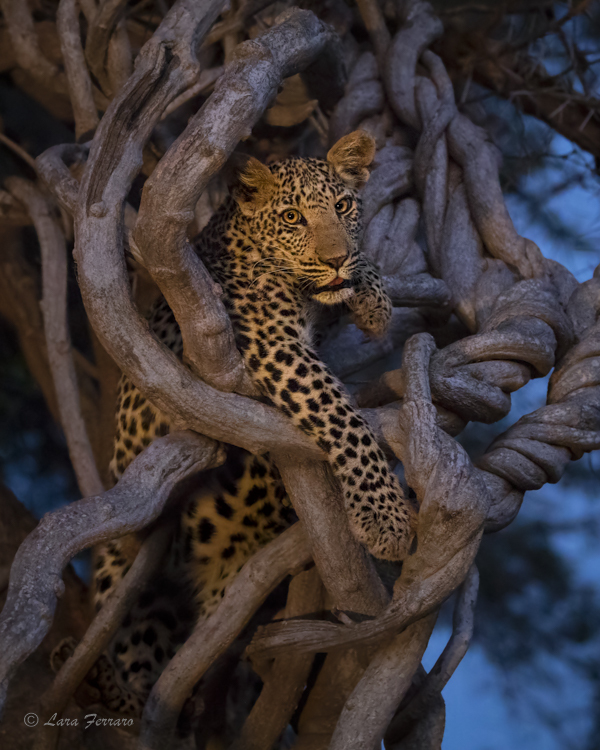 However the female would not let him approach the tree fiercely growling and hissing to keep him away. Our guide indicated that this is normal and that when one of the cubs feeds even the mom cannot get close. Over ten years ago we purchased our first long lens and Bolsa Chica Ecological Reserve became my favorite local nature escape. Over time I became busy with other things and my Bolsa Chica outings became infrequent. Unfortunately it seems like the bird opportunities have also dropped over time. Although it's still a wonderful place to visit - "slow" days seem to be more common now. Today I would like to share a photo of a couple of adorable hyena cubs that we saw in 2015 in Kenya. 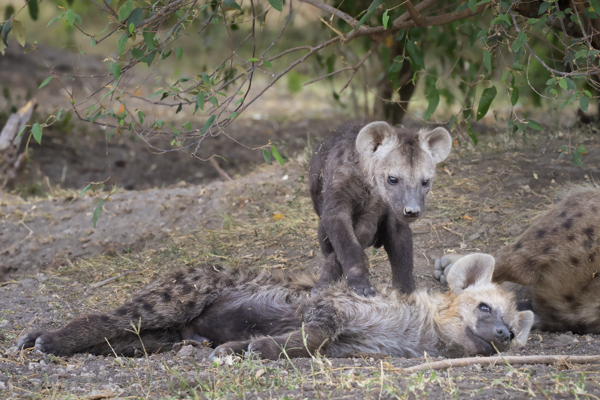 A young hyena cub is trying to rouse an older cub to play. He was unsuccessful, so he wandered off on his own and eventually came back to cuddle with the older cub. The cub was restless and it wasn’t long before he was up and looking for more adventures. Hyenas live in social groups that are referred to as clans or cackles. 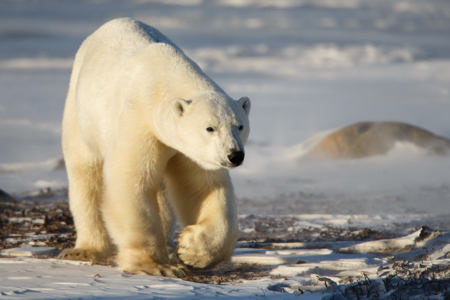 These groups can be as large as 80 - which is why you see cubs of different ages in the photos. Mothers will share nursing responsibility and any clan member can bring back food for the young. The young are referred to as cubs since are closely related to cats. On a personal note, I am restarting my blog and keeping the content shorter and focused on one image. This should help me post more frequently 😉 I hope you enjoy it! Recently I read an article in Outdoor Photographer:Create Visual Tension that made me reflect about the visual impact reversing a photo can have. I'm familiar with the concept of reversing a photo, but prior to reading the article I never considered it for my photos. Landscapes with identifiable landmarks like Yosemite's Half Dome or Colorado's Maroon Bells would look wrong reversed. On a deeper level part of me is bothered by a feeling of misrepresenting what occurred. I do edit my images and modify things like color and contrast. I have no problem using HDR processed with natural settings. The camera cannot accurately represent all the colors that the eye sees so it does not seem a stretch to modify these areas. However, reversing a photo has always felt like it crossed the line in representing the scene differently. California Brown Pelicans (Pelecanus occidentalis) are one of my favorite birds. 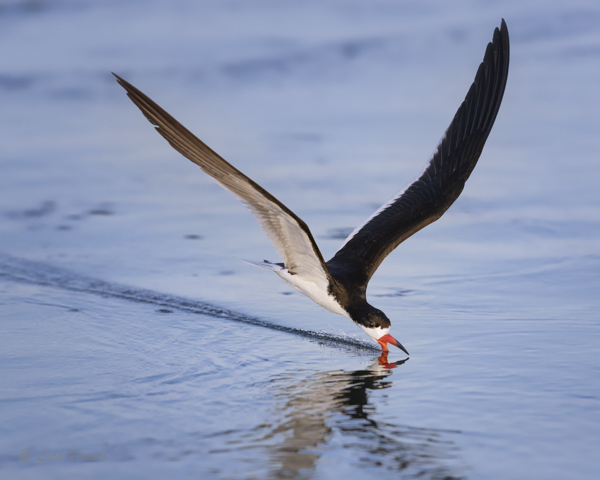 They combine a distinctive mix of graceful flight with awkward clumsiness on land that make them so much fun to watch. January is the best time to view them because they are particular beautiful in their mating colors: bright red pouches, yellow heads and dark brown necks. La Jolla Cove in San Diego, California is a stunning place to view the flocks that gather there. One of the unique aspects of Brown Pelicans compared to other pelican species is that they can dive from as high as 60 feet in the air to catch fish. 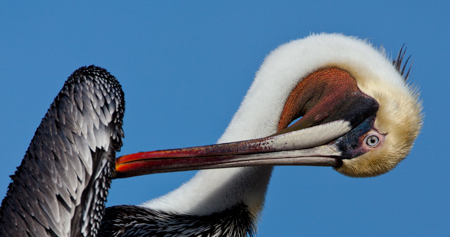 The pelicans are protected from impact by a special network of air sacs under their skin, however the fish aren't so lucky. These dives can stun fish for 6 feet underwater. I’m a software engineer by day, so it seems appropriate to start off my first blog post with “Hello World” J For those who are unfamiliar the classic first program that you write in a programming language is one that outputs the words “Hello World”. When I’m not working my greatest passions are enjoying nature, photography and travel. I combine the three together whenever possible utilizing photography to record and share the natural beauty and wildlife that I find.